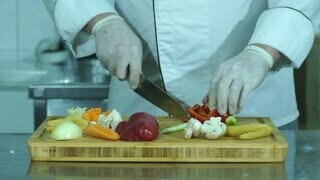 Chef is cutting bell pepper. Red paprika on cooking board. Key ingredient for vegetarian soup. Chef and meat on board. Steel bowl on cooking table. Hand cutting bell pepper. Cooking board with vegetable pieces. 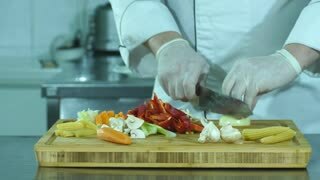 Chef cutting onion. Cooking board with fresh vegetables. Ingredients of spicy soup. 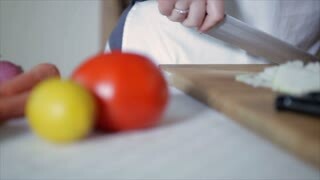 Chef cutting tomato. Cooking board and vegetable pieces. Natural ingredients for vegetarian dish. Raw pork on cooking board. 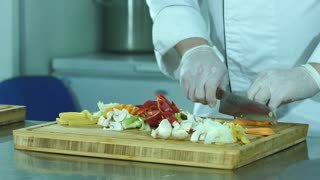 Chef's hands, knife and meat. Hand cutting cherry tomatoes. Vegetable on a cooking board. 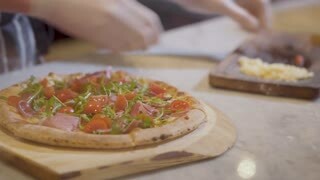 Cook's hands laying ingredients on a pizza lying and sprinkled with pieces of cheese on a wooden board. Cooking pizza. Cooking pizza.